3P Technik develops and manufactures rainwater harvesting components. Since 1990 relentless focus on innovation has led to product development every year. 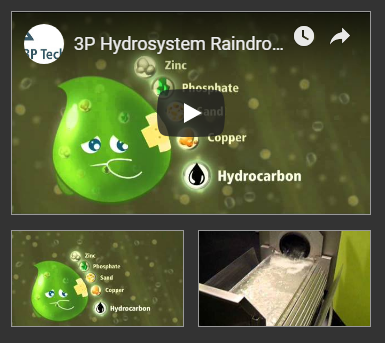 As a result, 3P UK stocks the very widest range of rainwater harvesting filters and components, water butts and stormwater treatment devices in the UK. 3P supplies everything needed for domestic or commercial rainwater harvesting (RWH) systems, except underground tanks. In particular, 3P UK has developed a variety of sophisticated white-label controllers. These Pump Controllers,built and programmed at the 3P base in Cardigan, are used in RWH and pressure boosting applications. Many of these systems use our Steelpumps for pumps, class leading Automatic and Manual steel bodied pumps. For over a decade 3P has developed a range of treatment products for stormwater management. These treatment devices are designed for deployment within a SuDS treatment train. These products include fully DiBT-approved (and the lesser NJDEP/NJCAT approved) storm water filtration systems. These treatment train devices are sold via Lead Partners in the UK and Ireland. The SuDS water quality treatment sector is undergoing great changes. These surface water runoff Proprietary Treatment Devices form part of the SuDS treatment train. 3P Technik also offer to trade, a continually growing range of garden water butts and accessories, all shipped from the 3P UK base in Wales. These are increasingly used as SuDS planters, in attenuation schemes. 3P Technik is the sole Trade Only supplier to the UK and Ireland RWH sector. 3P UK offers products from UK held stock – all supported with a class-leading delivery service, expert technical advice, and high-quality after-sales support to its valued customers. 3P Technik is an owner managed company. Trade visitors are always welcome to visit us, to inspect the product range, and discuss any bespoke RWH system requirements with the 3P Team. Please contact us at any time.